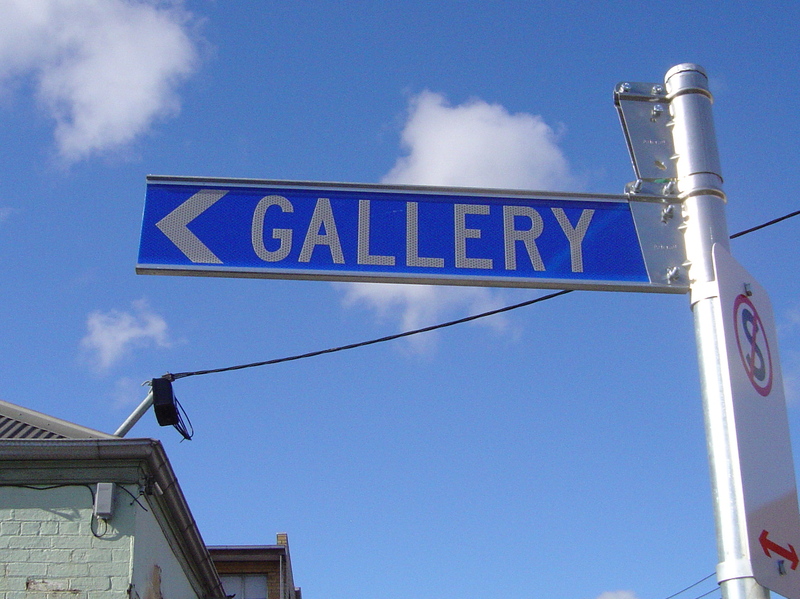 I keep on writing about art galleries, a room or series of rooms where art is exhibited, whatever it is called: “gallery”, “projects”, “art space”, or “artist run initiative”. I’m not sure that this has been a good idea. Few galleries state what they are above their door, ACGA members have the association logo sticker on their door, and 45 downstairs now states “a not for profit artspace” above their door. And this raises a important question: does it matter? “Projects” are currently in fashion in Melbourne, everyone is starting a project space from Sutton Gallery to Dianne Tanzer. “Projects” is short for “side projects”. What kinds of side projects do commercial galleries? Exhibitions in non-gallery spaces and so some galleries now have non-gallery spaces for exhibitions. Why do structural analysis of the art world? This structural understanding of the art world has lead to a whole genre of art that refers to this structure. Questioning the institution of the art gallery may have started with Duchamp’s readymades but it became an art movement in the 1970s. Examining the institution revealed issues of power and ownership and cultural and sexual identity – some of this work has been fun but it is not what art is all about. And along with this some people have confused attacking the art gallery with analysis of its role. Tom Wolfe’s sardonic comments on the emergence of contemporary art outside of the gallery have something of zeitgeist in them. “…the late 1960s, and the New Left was in high gear, and theorists began to hail Earth Art and the like as a blow against ‘the Uptown Museum-Gallery Complex’, after the ‘military industrial complex’ out in the world beyond. If the capitalists, the paternalists of the art world, can’t get their precious art objects into their drawing rooms or even into their biggest museums, they’ve had it.” (Tom Wolfe The Painted World, Bantam, 1976, p.102) Tom Wolfe, the artists, their dealers all knew that this would not be the end of the museum-gallery complex anymore than it would be the end of the military industrial complex but it was a story that would sell. After all a “gallery” is just a fancy word for a room with some art in it. I don’t know about your house but mine does not look like a contemporary art gallery. The walls are the wrong colour for one thing and then there is all this stuff lying around. I do have art on my walls and a few sculptures around the place but it doesn’t look like any art gallery that I know. Even the serious art collector’s homes don’t look like art galleries. I sometimes ask people after visiting a major art gallery about what they would most like to have in their home and remind them that it has to fit in their home. Where are you going to put it? Some work of art, like a Duchamp readymade, would mean less alienated from the gallery space. And what are you going to do with all that video art? Buy a flat screen TV and DVD player for each one, or just keep them in a draw? This is not because I think that art should not respond to the gallery, or that galleries have made art worse but that the obsession over the space, including all my writing about galleries, has been a distraction from the main event – the art. How much does the space, what ever you want to call it, change the art? This entry was posted on Tuesday, August 6th, 2013 at 2:17 PM	and tagged with ARI, art collectors, art gallery, artist run initiative, arts, earth art, Tom Wolfe and posted in Art Galleries & Exhibitions. You can follow any responses to this entry through the RSS 2.0 feed.